In “Poems from the Heart,” the author puts many years of experiences and emotions through the beauty of poetry. “Each poem provides a raw and intimate look into his life as he explores feelings such as joy, love, despair, grief, and insignificance”. 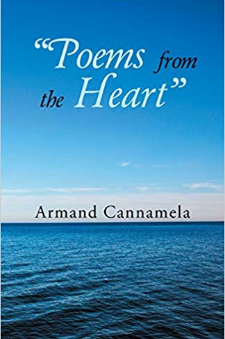 Through the years, Armand Cannamela always hoped to share his many experiences through the art of poetry. Putting that dream into action, he carefully expressed his heart out into words until he finished pieces that are worth sharing. Now that his poems are in his debut book, he now how hopes that this collection will touch the hearts and minds of his readers. “Poems from the Heart” digs deeps into the author’s hearts. He immortalizes his thoughts, and his emotions into every piece and encourages readers to contemplate on their own experiences through his. Each poem provides a raw and intimate look into his life as he explores feelings such as joy, love, despair, grief, and even insignificance. “Poems from the Heart” will soon grace the upcoming Los Angeles Times Festival of Books on April 13-14, 2019 at the University of Southern California. His heartwarming poetry collection will be on display along with other great titles during this exciting literary gathering. Known as one of the biggest book fairs in the country, this is something everyone should check out!